Well Dear Reader…it has been a while since my last post, as well…things were going along swimmingly. The plants in the system were thriving, we had tried out different growing arrangements, tried new vegetables and herbs in the grow beds (and NFT) and continued to marvel at the rate of growth of all things lettuce! We had even increased the population in the Sump Tank (with the introduction of four more gold fish: the Tiger Team and Smudge) and had farewelled the last of the Barramundi, after discovering the last cold, still body—floating belly up on an unusually chilly-for-Brisbane morning. During the lead-up to the Last of the Barras episode, we had introduced some extra heating and some extra oxygenation via air stones; but methinks it was too little, too late. That was back in June, and we had moved on, by restocking Tank 3 with more ‘you-can’t-bend-em-you-can’t-break-em’ Jade Perch. Bless the Jades and their hardiness! Days melted into weeks, with nerry a pH spike or an aphid outbreak. Cruisin’ as they would say. But, alas, we are but human, and while we were on a rather happy and fruitful roll with everything, something just had to come unplugged, didn’t it? with the advent of the cooler weather we had decided that we would not cycle the water through the whole system at night. The grow beds and NFT are out in the open, and with that surface area and the constant flood and drain action, we decided that the beds were acting like a heat-sink, and effectively cooling the fish tanks. A timer was fitted to the system to turn the water-circulating pump off at 6pm and back on again at around 7am. as water flow is our main source of aeration, and with this now switched off at night, we needed to ensure the fish had enough oxygen, so we installed air stones (stone-like bubblers that have air pumped through them). These were plugged in and run constantly, alongside the heating elements—except of course when we cleaned the tanks—they were turned off as a safety measure. So at approximately 6am on Tuesday morning he heard splashing coming from the tanks, and thinking it was the fish feeding (‘but hang on I haven’t fed them…’) he raced to the tanks to discover a swathe of the Jades in Tank 2 belly up and many more gasping. It’s terrible. It is. He was mortified. I was sad but even sadder to see him so distressed. So over the next few hours, and indeed day, we have pulled approximately 50–60 dead Jades, ranging in length from 10–15 cms from Tanks 1 and 2. I was fascinated by how many fish were actually in Tank 2, which seemed to fare the worst (approx 80% loss—I guess with the larger population, they used up the available oxygen faster). All the fingerlings in Tank 3 (they have been in situ for about a month) were not impacted at all. So. What do you do? With this hard won knowledge you have to write about it and share with anyone who may also be running an aquaponics system…our mistakes can be others’ lessons. But what of the fish? Initially we decided to freeze them all in small batches and slowly reintroduce them back into our backyard system as cooked ‘meal’ for our chickens—I dare say one of the best and purest form of protein they will ever get! But with an enthusiastic word of encouragement from my youngest son (“I’m sure you could eat them!”) I got terribly brave and gutted 15 of the largest ones, with the view to maybe deep frying them a la some rather rustic seafood meals I had in Spain in 2010. And with the ‘fish guts’ I made ‘Fish Gut Risotto’ for the chickens. I can see the screwed up expression on your face right now, but it seemed like the right and sustainable thing to do…not to waste a thing. 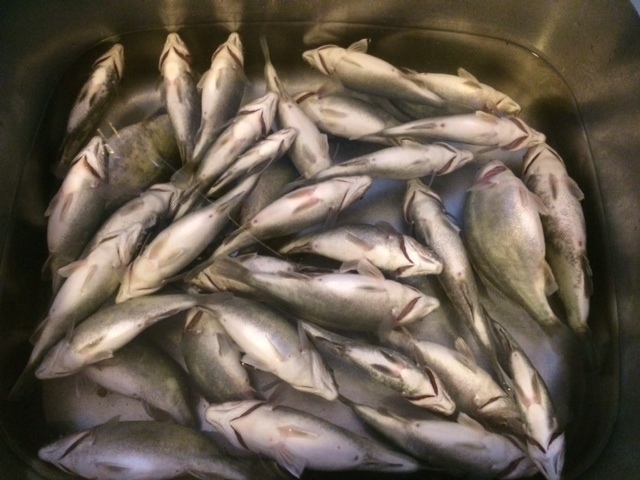 I cannot lie, during this whole process, my head got very busy with what I was doing—gutting our ‘baby’ fish, and I did have to lie down for a bit before I fainted. I am sorry to hear about the bubble stones misshap. It sounds like an easy mistake to make. I am just glad that Chris was home and heard that the fish were in distress and was able to save as many as he did. Good luck with the new fish breed. I am sure it is all a learning curve and it is always helpful to share what you have learned to spare someone else your mistakes. I am glad you are back up posting. That would have been a horrible experience. I remember years ago i sprayed some fly spray to kill off some ants in my bedroom and inadvertently killed my fish too. Boy, did I feel like crap afterwards – like some sort of terrible fish murderer. Over it now, but I can really relate to poor Chris. All I can say is that these things happen and it’s a good lesson so it’s positive in the end. And brilliant use of your deceased fish too!